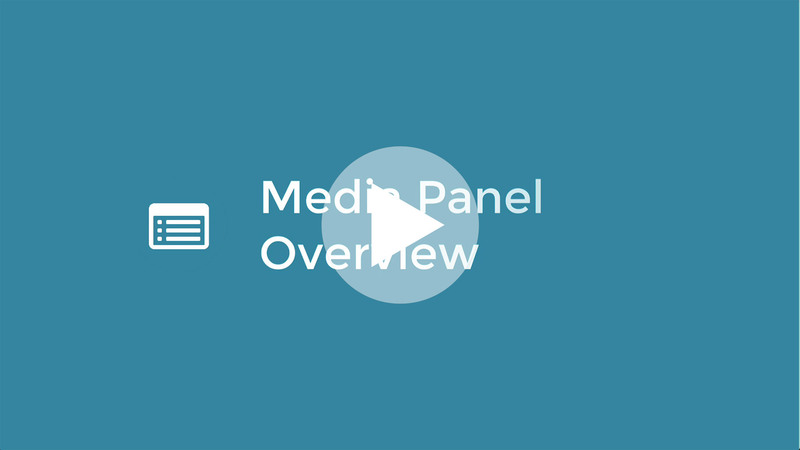 Need to know what everything is when you first load the Cloud Media Management Panel? Here's a at-a-glance tour of the Media interface. All Media Section - Displays all your uploaded and created media files and players. Deleted - Manage any deleted media within the last 24hrs before permanent deletion. Playlist Folders - Add multiple playlists to one playlist folder which you can publish to a single multi-playlist player. Playlists - Add any type of media files to playlists and publish them with the playlist players. Add Media - Add local Video & Audio files or create Live Stream Players, Web TV Players and Live IP Cam Players. Duplicate - Create duplicates of your selected media without taking extra cloud storage. Delete - Deleted the selected media file or player. Live Studio - When selecting live event players you can launch the live studio to control your live event stream. 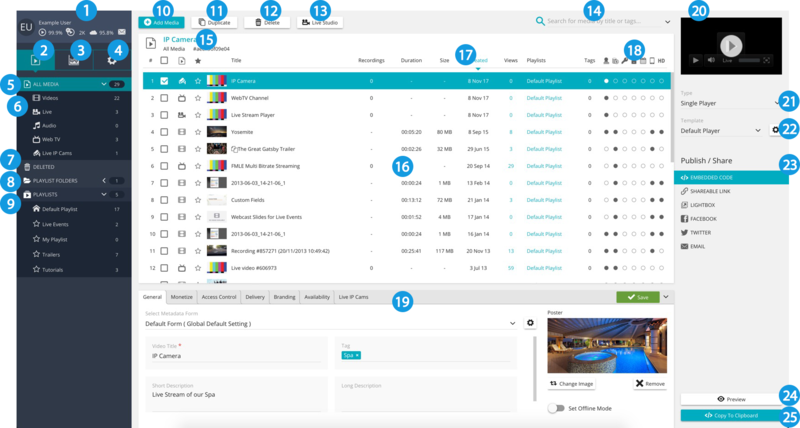 Search Field - Search your entire media or look deeper with the advanced search system. Selected Media Summary - Displays the name and reference code for single selected media. Media Selection Panel - Displays the currently selected media with detailed information. Media Arrangements - Arranges the media by different data such as creation media type, favourite, title, recordings, duration, size, creation date, views, playlist, tags, branding, monetisation, password, access control, scheduling, mobile compatibility and HD quality. Enabled Options - Shows if a media file or player has one of the following options applied to them: Branding, monetisation, password, access control, scheduling, mobile compatibility and HD quality. Quick Settings Panel - Allows you to quickly manage and apply different settings to the currently selected media including: General information, monetization, access control, delivery, availability, live ip cams. Quick Publishing Panel - Shows you a preview of the currently selected media as well as allowing you to quickly publish a player. Type Selection - Select which type of player you would like to quick publish. Template Selection - Select your preferred template for quick publishing. Publishing Type - Select how you would like to publish your player including: embed codes, sharable links, light box, facebook, twitter, email. Preview - Preview the player you are about to publish. Copy To Clipboard - Copies the embed code / direct link to your computers clipboard.